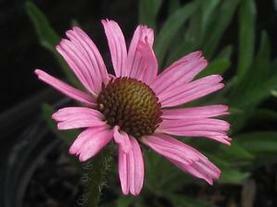 'Magnus' Purple Coneflower has pink flowers in June and July. The dried seeds feed Goldfinches in the fall. From the Jelitto Seed Company. 1998 Perennial Plant of the Year. ‘Pow WowWhite’ Coneflower is a compact, heavily flowering selection with flat white petals surrounding the round orange cones. Since the ‘PowWow’ series does not require vernalization, ‘PowWow White’ and ‘PowWow Wildberry’ start blooming early in summer and keep going well into August. The compact habit and sturdy stems makes this Coneflower an excellent choice for the front of perennial beds and rock gardens. 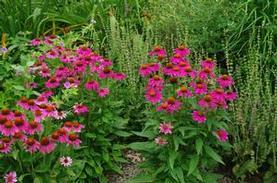 Insects and song birds use Echinacea significantly as a food source. 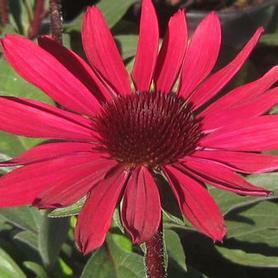 ‘PowWow Wildberry’ Coneflower blooms for a very long period starting in June and continuing into August. The vivid rose pink flowers have flat petals surrounding the orange cone and are held up on thick sturdy stems. The ‘PowWow’ series of Echinaceas are from seed, but their compact habit and clear colors are consistent, unlike many seed strains. Introduced by PanAm seeds, and reliably hardy in sunny dry sites in the Northeast. PRN Preferred: Compact habit, overwinters very well. 'Rocky Top' Tennessee Coneflower is a nursery-grown selection of the rare native which is on the Endangered Species list for wild plants. 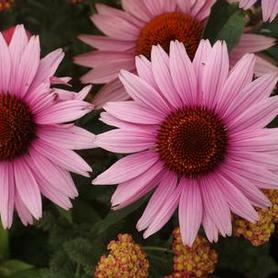 Echinacea 'Rocky Top' was selected from a seed grown population because of its greater vigor and larger pink coneflowers. 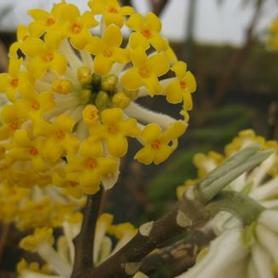 The blooms appear above the long narrow leaves in June and July. It grows best in sunny, well-drained sites. 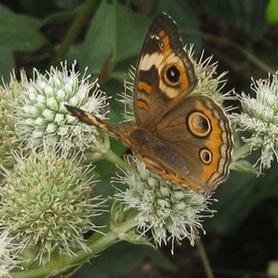 This rare Southeastern native is a good source of food for both Goldfinches (seed) and butterflies (nectar). 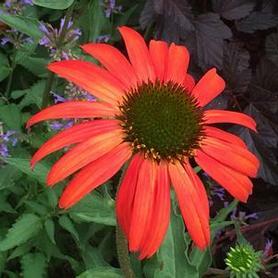 The flowers of 'Solar Flare' Coneflower are large and red, set off by contrasting dark cones and long dark stems. The effect is striking in the garden or as a cut flower. ‘Solar Flare’ blooms for an extended time from early to late summer, especially if deadheaded occasionally. Butterflies are attracted to the vivid flowers, and the dried seedheads are an important fall food source for finches. 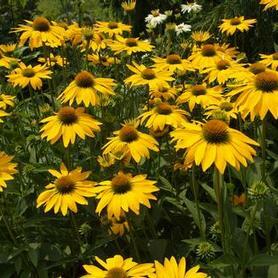 'Leilani' Coneflower starts blooming in July, and produces tall bright yellow non-fading flowers with many horizontal petals surrounding the orange prickly cones. 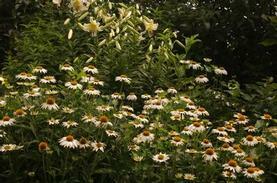 The flowers appear in great numbers for a long time throughout the summer. The seedheads in the fall are an important food source for songbirds, and butterflies flock to the fragrant blooms in summer. Echinacea 'Leilani' is an excellent addition to the back of a perennial border, and is great as a cut flower because of its long sturdy stems. PRN Preferred: Dark yellow flowers, overwinters very well. We have trialed this plant successfully for numerous years and have been very impressed. 'Tomato Soup' Coneflower flowers in early to late summer, producing tall sturdy flowers with tomato red slightly pendant petals on strong stems. Echinacea paradoxa is one of the original parents in the complex crosses producing Echinacea x 'Tomato Soup', which explains the petal droop. Like the other Echinaceas, 'Tomato Soup' thrives in well drained sunny sites, and looks stunning in masses. A good choice to use in prairie and meadow settings. Introduced by Terra Nova Nurseries, as one of the Prairie Star™ series. The beautiful violet flowers of 'Lilafee' Barrenwort are large in size, over neat, delicate foliage in April. Epimediums thrive in dry shade and 'Lilafee' is semi-evergreen. An interesting fact about Epimediums is that they are in the Barberry family (hence deer resistant). PRN Preferred: Heavy bloomer, flower color stands out in spring gardens. 'Purple Pixie' Barrenwort was found by Dr Richard Lighty in his own garden, as a surprising sport of Epimedium grandiflorum 'Alba'. 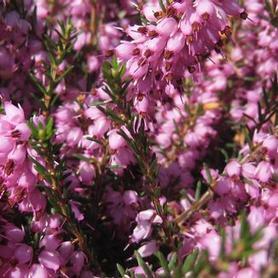 The delicate flowers are a deep violet purple with extended white spurs, and they hover over the fine green foliage in April. 'Purple Pixie' makes an excellent semi-evergreen clump in shady dry locations, and the refined, heart-shaped leaves emerge in the spring in shades of burgundy and purple. 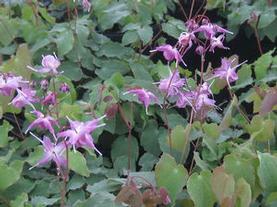 'Purple Pixie' performed very well in the Chicago Botanic Garden's Epimedium trials. PRN Preferred: Showy spring foliage topped by purple flowers, received very high ratings in the Chicago Botanic Garden's trials. 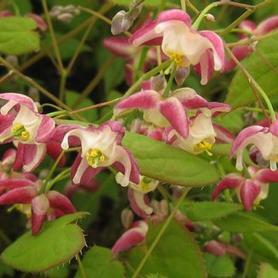 Epimedium grandiflorum 'Rose Queen' has rosy pink flowers of large size in April, making it a very showy Barrenwort. It thrives in dry shade and is semi-evergreen. The flowers look like miniature Columbines hovering above the leaves. 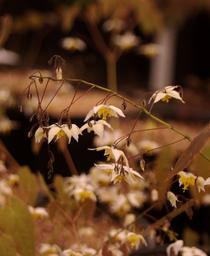 'Domino' Barrenwort comes from the prolific hybridizing work of Darrell Probost, the 'Epimedium King'. 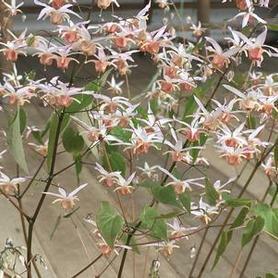 Epimedium x 'Domino' is a very heavy bloomer in April and May, producing a multitude of airy flowers displayed on burgundy stems. The blooms have long white spurs which end in rose purple cupped centers. The spikes emerge from toothed evergreen leaves which are mottled with large burgundy spots. This is one of Tony Avent's favorite 'Fairy Wings' because of its heavy reliable flower production. 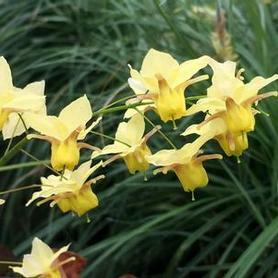 'Mandarin Star' Barrenwort is a new introduction from China with unusual floral coloration. The tepals ("spurs") are long and white, and the petals are yellow. The delicate blooms float above the heart-shaped leaves in April. 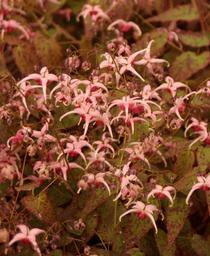 Epimedium x 'Mandarin Star' delicate beauty is making this Barrenwort increasingly in demand. 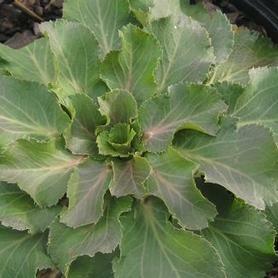 The foliage is semi-evergreen and attractively dentate, with bronze new growth emerging with the flowers in April. 'Pink Champagne' Barrenwort blooms heavily in April, producing many long graceful panicles covered with delicate hovering blooms. The spurs are long and white, surrounding deep pink cups. The molted evergreen foliage continues the show after the bloom period with dark purple splotches decorating the fine green leaves. Another striking contribution from the prolific breeding work of Darrell Probost. Like all Epimediums, this makes an excellent long lived groundcover for dry shade. 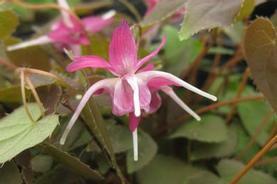 'Pink Elf' Barrenwort blooms in April, with lots of delicate pink flowers hovering over the fine evergreen foliage. The spurs are pale pink and the cups are a darker bronzy pink. The leaves are heart shaped, and new growth in the spring starts out with attractive pinkish flecks. This interspecies hybrid comes from Robin White and makes an excellent compact groundcover for shady areas. 'Frohnleiten' Barrenwort has butter yellow flowers with good strong color in April and May. It does well in dry shade and is semi-evergreen. The new leaves have red veining in spring, which shows up again in the fall. Red Barrenwort has red flowers in April over red-tinged green leaves. 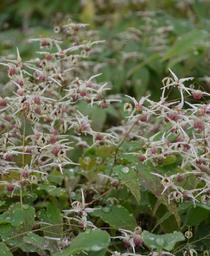 It is a vigorous shade groundcover and semi-evergreen. The flowers are relatively large for a Barrenwort. 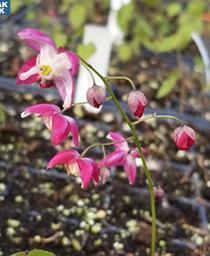 'Galadriel' Barrenwort provides showy red blooms with white spurs and centers in April. The flowers hover over the emerging red tinged leaves. 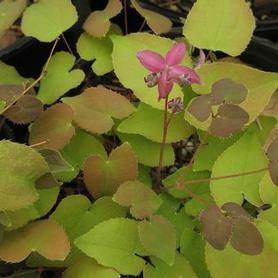 Epimediums make excellent slowy spreading groundcovers for shady areas, and Epimediums x 'Galadriel' also adds an attractive fall element with bronzy semi-evergreen leaves. 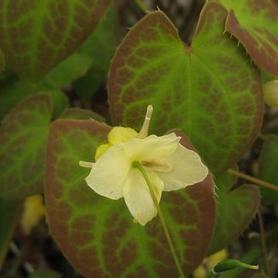 Sulfur Barrenwort has yellow flowers in April over large green leaves. It is a vigorous shade groundcover that is semi-evergreen and covers an area more rapidly than most Barrenworts. 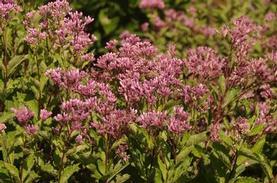 PRN Preferred: Excellent vigorous choice for a groundcover perennial. 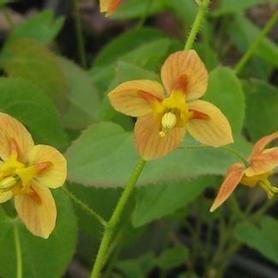 'Orange Queen' ('Orangekoningin') Barrenwort has pale orange flowers that float above the red-tinged newly emerging leaves. 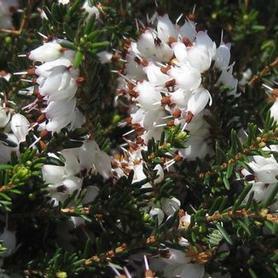 The foliage matures to green in the summer, with reddish tones in the fall. Semi-evergreen and dry site tolerant. The species name warleyense indicates that this lovely Barrenwort's parents originated in the English garden Warley Place, belonging to Miss Ellen Willmott, but the actual cross was the work of the German plantsman Ernst Pagels. 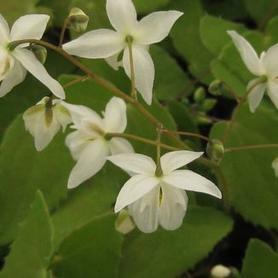 The white flowers of Young's White Barrenwort appear over small delicate foliage in May. Newly emerging leaves are purple, turning to green as they mature. It is semi-evergreen and slow growing. Purple Lovegrass is a short warm season grass which is best planted in mass. 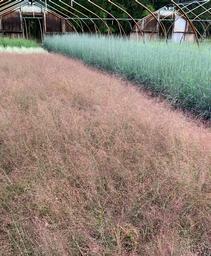 The effect is stunning when Eragrostis spectabilis comes into bloom in August and September. The airy panicles are bright shades of reddish purple, making a showy carpet over sandy, dry and infertile soils. In the fall the foliage takes on shades of reddish bronze. This tough native provides good erosion control. ‘Big Blue’ Sea Holly is an amazingly different color addition to the well-drained garden. It has silvery green thistle-like foliage which is topped by glowing blue stems and flowers. The blooms in June look like tiny blue artichokes, and are held well above the leaves. Thriving in dry sandy sites, Eryngium ‘Big Blue’ is also deer resistant. 'Blue Hobbit' Sea Holly produces silvery blue spiky globe flowers on short stems in summer. The blooms are a very unusual shape and color, emerging from a low mound of green basal foliage. All the Eryngiums must have excellent drainage and do best in dry sites. 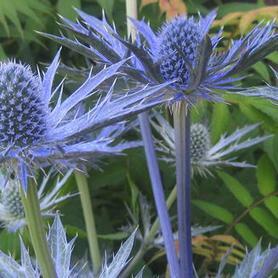 'Blue Hobbit' is much more compact than other Eryngiums, so it would work well in rock gardens. Butterflies love the odd flowers, and happily, deer do not. Rattlesnake Master is an interesting oddity for unusual perennials borders, with grayish green spiny leaves from which spring its very tall flower spikes in July and August. The blooms are a pale silvery blue and look somewhat like round thistles. Tolerant of both dry and moist conditions, this dramatic looking native got its name from the formerly held theory that its sap cured rattle snake bites. As Dr. Alan Armitage says so succinctly, "Fat chance". Butterflies love it. 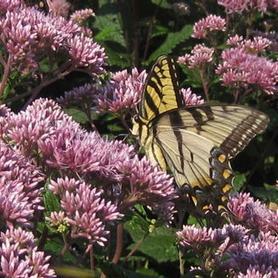 PRN Preferred: All the great attributes of a Joe Pye Weed but a more compact form. 'Mrs. 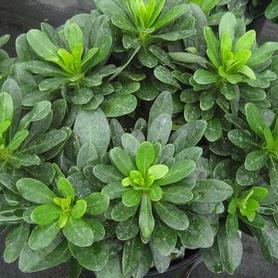 Robb's Bonnet' Wood Spurge has yellow flower bracts in May and green evergreen foliage. Great for dry sites. The Scott Arboretum of Swarthmore College uses this extensively in dry shade.